Of all the places to visit, who would choose a volcano? 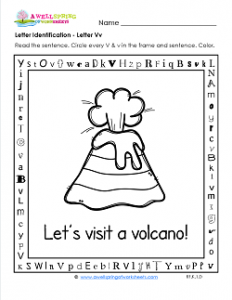 Well, for the sake of this letter v letter identification worksheet, I thought it would be a good idea. Have your kids search for and circle all the v’s in the frame (12 total, 3 on each side) and the sentence. You might want to have them count them all. If you do, the total is 14. You can also have your kids search for the hidden sight word. It’s a tough one because the first letter is lowercase and the second letter is uppercase. It’s the word “to” in the top part of the frame. Have fun and don’t forget to color!